Vegan makes it sound all fancy doesn’t it? LOL – I just didn’t want to be one of those bloggers that called it ‘dairy, egg, gluten, wheat, refined sugar free ice-cream’… I’m puffed just typing that! 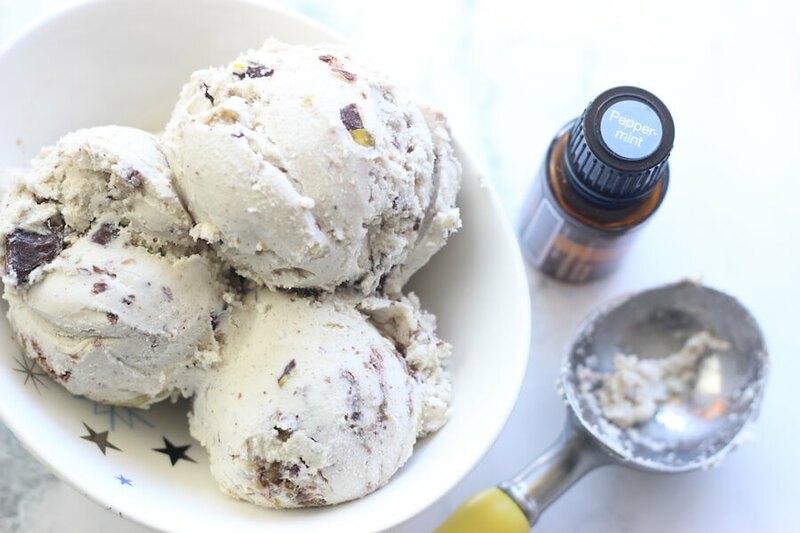 Anyhow, this ice-cream is a great wholefood ice-cream that’s really really really yummy! I let my daughter have it for breakfast some days, cause it’s THAT healthy!! One thing I can’t stress enough though, is that you need to purchase a peppermint essential oil that’s pure and food grade – doTERRA ticks all those boxes which is how we started using essential oils. Tracey just wanted to make Peppermint chocolate, but finding Peppermint that we were happy to eat was really hard! You can purchase your essential oils at wholesale price (which is what we pay) by registering your wholesale account. It’s super easy and well worth doing (click here for the info)! Otherwise, you can purchase your Peppermint oil retail from our Sistermixin’ store (click here). This ice-cream will go hard once frozen, so don’t expect to pull it out of the freezer and grab a lovely big scoop like we’re used to with bought ice-cream. It doesn’t contain any anti-freeze, preservatives, or isn’t filled with air, so you won’t get the same effect. I find if you get it out when you’re eating dinner, it’s usually soft enough to scoop by the time you’re ready for dessert. Otherwise you could pop the container in some hot water, or you can defrost in the microwave. Add all ingredients to your thermie and blitz on speed 7 OR blitz in in a blender on high speed until nice and smooth. Approx. 1 min. Pour into a (freezable) container and freeze until set. Approx. 3-4 hours. Peppermint is also how I found DoTerra! Kids and adults all like this ice cream. I now freeze into cubes and keep in a ziplock lock, then I can blitz creamy again and mix in some broken chocolate pieces! Would it be ok to substitute the coconut with almond milk and oil?